Preliminary ProceduresRemove the theft deterrent module. Refer toTheft Deterrent Module Replacement.Remove the turn signal switch bracket. 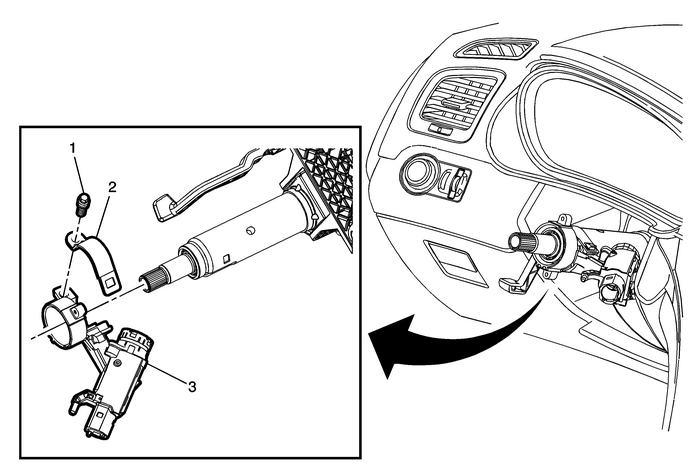 Refer toTurn Signal Switch Bracket Replacement.Disconnect the ignition and start switch electrical connector. ProcedureUse any of the following common tools to remove the OLD ignition and start switchhousing bolt:An angle grinder and screwdriverA small hammer and chiselA screw extractorA center punchDiscard the OLD ignition and start switch housing bolt.Install the NEW ignition and start switch housing bolt and tighten until the bolthead breaks off.